Bloodworld.in was created on 15 August 2011 to provide the people of India with safe, appropriate and timely access to blood. We started this mission with one idea in mind - connecting people with heart with those who need life. 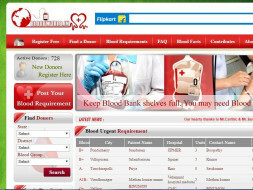 To provide the people of India with safe, appropriate and timely access to blood. I am a volunteer of www.bloodworld.in and I personally donated blood more than 30 times since 2000. Presently we planned to rise money to redesign the website with latest responsive design and develop android mobile app. Also plan to promote the website and mobile app through digital marketing to reach get blood donor register in our website.